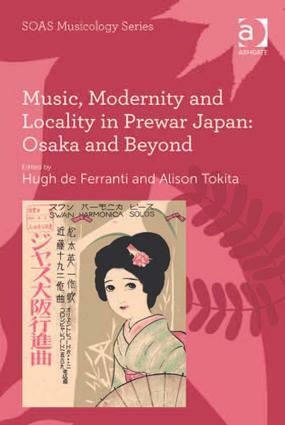 Hugh de Ferranti’s published research is on historical and contemporary forms of biwa music, the practice of Japanese music beyond Japanese shores, and music-making among minorities in colonial era Japan. He is the author of Japanese Musical Instruments (OUP 2000) and The Last Biwa Singer (Cornell University East Asia Series 2009). He is Associate Professor in Music at the University of New England. Alison Tokita is Professor and Director of the Research Centre for Japanese Traditional Music at the Kyoto City University of Arts, and adjunct Associate Professor in Japanese Studies at Monash University. She has published widely on Japanese narrative music, and is currently working on naniwa-bushi. In recent years she has researched the role of the piano in East Asian musical modernity. She is co-editor of The Ashgate Research Companion to Japanese Music (Ashgate 2008), Complicated Currents: Media Flows, Soft Power and East Asia, and Outside Asia: Japanese and Australian Identities and Encounters in Flux.